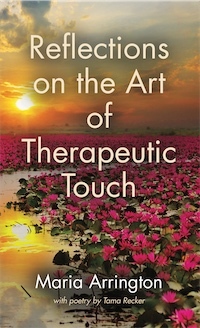 For practitioners of Therapeutic Touch©, this book is an examination of what it can be like to choose to practice this healing modality as an art instead of a technique. Using poetry and a deep examination of the various aspects of Therapeutic Touch, readers are encouraged to reflect upon their own healing journey. Ebook $9.99 Download Ebook instantly! Students who embark on the journey of Therapeutic Touch© begin by learning a technique – outward steps and processes that help them to understand how to intervene energetically to foster better wellness for others, and how to understand themselves as a healer. As they develop through experiencing the healing process over time, things begin to shift and change. Their awareness of the energy dynamics occurring in the field of their recipient grows and diversifies. On an internal level something is also happening. They begin to open to the deep core of intelligence that flows just beneath the surface of their awareness-the timeless self. From this source, come the intimations about how best to intervene in the flow of energy so that their recipients become more deeply whole. Their skill with a technique has become the mastery of an art. With this mastery comes a new understanding, for slowly they perceive that the intelligence of the timeless self is the selfsame power that flows through the energy matrix underlying all of material reality. The truth becomes apparent: We are all one. There is no separation. And we use that truth to offer healing to our world. Through discussion and poetry, readers of this book open to a reflection of their own experiences as they traverse the journey of Therapeutic Touch© and of healing in general. By sharing her journey from being a new student of Therapeutic Touch through her growth as a TT artist, healer, teacher, and mentor, Maria Arrington created a space for me to reflect on my own journey to TT as a lifeway. She made the process of coming to know one's inner-self available to me in a new way. The personal stories, heartfelt experiences, and creative metaphors in Reflections on the Art of TT describe the rich journey from beginner to experienced Therapeutic Touch therapist. This book gave voice to my own internal evolution and these descriptions will also provide a guiding light for TT students in their own evolution as TT therapists. Maria Arrington’s book is deeply insightful and is written with compassion and intelligence. It is a true reflection of her deeply evolved journey with Therapeutic Touch, learning, practicing, teaching, and living this amazing healing way. The poetry by Tama Recker is profound and is beautifully in sync with the author’s intentions for each chapter. Maria Arrington is a retired nurse who has practiced Therapeutic Touch© for forty years. She works as a practitioner, teacher, mentor, and lecturer both at home in northwest Montana, but also nationally. Her background in healing extends to every aspect of wellness from pediatrics to hospice care.